JACKSONVILLE, Fla., Sept. 7, 2015 /PRNewswire/ – APR Energy plc (the “Company”), a global leader in fast-track power solutions, today announces final signature and government approval of the extension of its 250MW power generation project through the end of 2015 with Usinas y Trasmisiones Eléctricas (”UTE”), the Uruguayan state power company. The approved contract terms and conditions are unchanged from the agreement announced on 1 July, including the pending sale of 50MW of gas turbines. In that announcement, the Company reported that it had reached agreement with UTE on the terms of the extension, and was awaiting completion of the standard government review. APR Energy has been serving UTE since 2012 through two power plants, located in La Plata and Punta del Tigre. 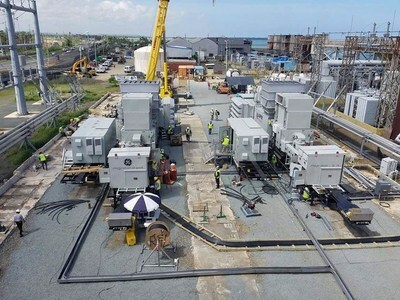 The mobile gas turbine solution provides bridging power while a permanent generating facility is being constructed as well as much-needed reserve capacity as the region deals with diminished hydroelectric power output resulting from a prolonged drought. Certain statements included in this announcement constitute, or may constitute, forward-looking statements. Any statement in this announcement that is not a statement of historical fact (including, without limitation, statements regarding the Company’s future expectations, operations, financial performance, financial condition and business) is or may be a forward-looking statement. Such forward-looking statements are subject to risks and uncertainties that may cause actual results to differ materially from those projected or implied in any forward-looking statement. These risks and uncertainties include, among other factors, changing economic, financial, business or other market conditions. Although any such forward-looking statements reflect knowledge and information available at the date of this announcement, reliance should not be placed on them. Without limitation to the foregoing, nothing in this announcement should be construed as a profit forecast.